Seroussi and her group then tried to build a model of what would happen if a mantle plume did exist there and see what such a plume’s effects on the ice sheet and heating in the ice might be. This model, aided by observations from a NASA satellite, helped explain the amount of heat such a plume might add. It could even melt several centimeters of ice right above, and explain some of the heat creating Antarctica’s hidden lakes and rivers. The researchers published the model in the Journal of Geophysical Research: Solid Earth. The presence and modeling of such heating is important data to have to understand the future of the Antarctic ice sheet. After all, warm ice flows faster than colder ice, like warm honey flows faster than cold honey. But no one has actually measured a plume. There’s just a new model to help explain a hypothesis. 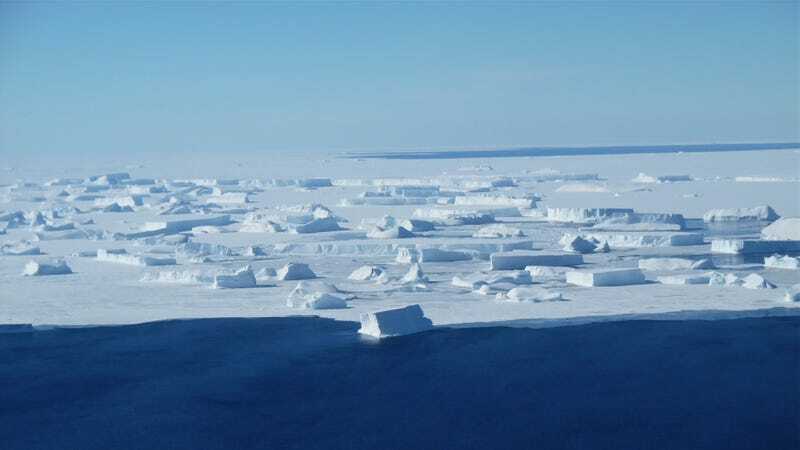 A research associate from the University of Texas, Duncan Young, explained to Gizmodo that the paper “is a valuable use of the advances in ice sheet modeling” integrating the sensitivity of the ice sheet into it. He points out that there’s more up-to-date-data that can be added, including satellite observations. Seroussi also told Gizmodo that more direct observations could help explain what was happening. So there you have it, dear readers. I was in the midst of reporting this interesting but maybe not so revolutionary paper about a geophysical model and suddenly a bunch of other people saw the press release, didn’t bother to read the paper, then went insane and decided that scientists made a huge discovery. That’s not what happened. But, uh, the model is cool.